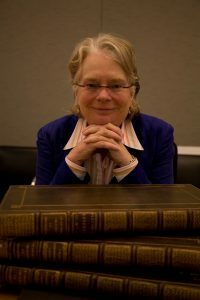 Lynn Hunt will give a talk titled “Why the History of Human Rights Matters,” at 7 p.m. April 26 in the Prairie Room of the Bone Student Center at Illinois State University. The talk is the annual Bone Lecture. Sponsored by the Department of History and part of the Illinois State University Speaker Series, the event is free and open to the public. A distinguished research professor at the University of California, Los Angeles (UCLA), Hunt has authored, co-authored, or edited books on the origins of human rights, the French Revolution, and other topics. Her books have been translated into 14 languages. Hunt’s new textbook on the French Revolution and Napoleon, co-authored with Jack Censer, has just been published, and her book, History: Why It Matters, will appear in 2018. Hunt earned a bachelor’s degree from Carleton College and a Ph.D. from Stanford University. Before joining the faculty at UCLA as Eugen Weber Professor of Modern European History in 1988, she taught at the University of Pennsylvania and UC Berkeley. She won distinguished teaching awards at Berkeley and UCLA.